Leading Manufacturer of ratchet lashing belt, ratchet lashing belts, polyester strappings and cargo ratchet lashing from Ahmedabad. To meet the diversified requirements of our prestigious clients, we are engaged in offering Ratchet Lashing Belt. Manufactured as per the industry standards, this belt is made using optimum quality components and innovative technology. 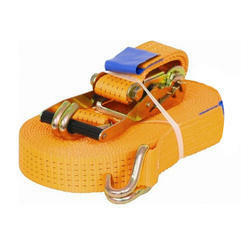 Lashing Belt is used for fastening in Cargo industry, airplanes, trucks, etc. Our company supplies corrosion resistant and highly durable Lashing Belts. Lashing Belts are available in endless or two part versions choice of 25mm - 75mm wide. Our company is a firm believer of providing in best products at economical prices. We are engaged in offering our clients a high quality range of Ratchet Lashing Belts. 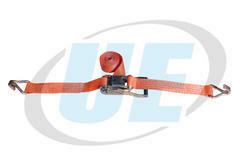 With this lashing strap you can fix everything safely and enjoy the ride. Even your surf board can be fixed on your car roof rack. 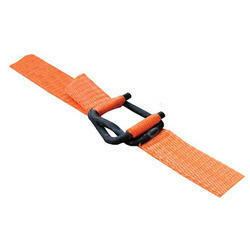 This lashing strap is made of an orange fabric tape with a fastener for fixing and tightening objects. 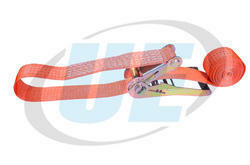 The lashing strap provides a belt tape measuring approx 2.5 cm in width and approx 4.5 m in length, as well as two plated round hooks and a ratchet with a rubber-coated handle. Its maximum traction amounts up to 250 kg. As an eminent enterprise, we are manufacturing, distributing and supplying highly efficient Polyster Strappings. This Polyester Webbing with a Seat-belt weave is lighter in weight than regular Polyester, but close in strength. Low stretch, low absorption rate, non-porous fiber, and high strength make this an excellent choice for outdoor uses as well. Polyester is a strong and durable material for webbing. It is used to provide safety and resilience over other webbing materials. Country Brook Design Polyester Webbing is offered in a beautiful array of colors making it an attractive addition to any project. Polyester combines many of the benefits of both Polypropylene and Nylon without some of the negatives. We are offering Cargo Lashing Ratchet. We are an acclaimed name engaged in offering our precious clients a superior quality range of Ratchet Lashing Belts. Used to converts the measured pressures to a linear output signal, these belts are manufactured using optimum quality raw material and progressive technology in compliance with industry norms. Keeping in mind varied requirements of our customers, we provide these belts in different sizes, thickness and specifications.